Martha Rose Shulman, renowned cookbook author and teacher of lighter but delicious cooking, shows you how to use fresh vegetables, fruits, and herbs; leaner meats, and low fat alternatives to high-fat ingredients. You'll be able to make vibrant, flavorful main dishes from around the world such as Asparagus and Herb Lasagna, Chicken Breasts with Green Tomatillo Mole, Beet Salad with Orange Juice and Parsley, and Roasted Red Peppers with tuna and Anchovies. Try these deeply satisfying desserts, including Rhubard and Strawberry Crumble with Creme Anglais or Pear and Red Wine Sorber. So do the seemingly impossible. Make everything from party dinners to intimate suppers to grand buffets. 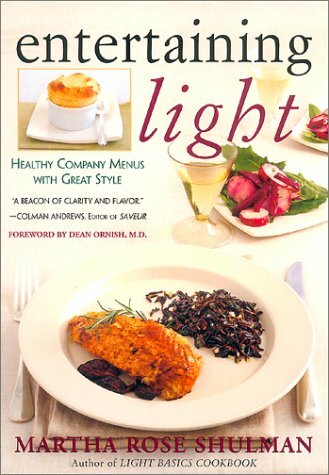 and make them light, healthy, and entertaining-all with Entertaining Light by Martha Rose Shulman.